Global Warming – 5 deadliest effects(back to back)! As northern countries warm, disease carrying insects migrate north, bringing plague and disease with them. Indeed some scientists believe that in some countries thanks to global warming, malaria has not been fully eradicated. Although some areas of Earth will become wetter due to global warming, other areas will suffer serious droughts and heat waves. Africa will receive the worst of it, with more severe droughts also expected in Europe. Water is already a dangerously rare commodity in Africa, and according to the Intergovernmental Panel on Climate Change, global warming will exacerbate the conditions and could lead to conflicts and war. Most of the effects of anthropogenic global warming won’t be good. And these effects spell one thing for the countries of the world: economic consequences. Hurricanes cause do billions of dollars in damage, diseases cost money to treat and control and conflicts exacerbate all of these. The ice caps’ melting is a four-pronged danger. Second, melting ice caps will throw the global ecosystem out of balance. The ice caps are fresh water, and when they melt they will desalinate the ocean, or in plain English – make it less salty. The desalinization of the gulf current will “screw up” ocean currents, which regulate temperatures. The stream shutdown or irregularity would cool the area around north-east America and Western Europe. Luckily, that will slow some of the other effects of global warming in that area! Global warming is the continuing rise in the average temperature of Earth’s atmosphere and oceans. 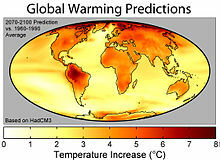 Global warming is caused by increased concentrations of greenhouse gases in the atmosphere, resulting from human activities such as deforestation and burning of fossil fuels.This finding is recognized by the national science academies of all the major industrialized countries and is not disputed by any scientific body of national or international standing. The instrumental temperature record shows that the average global surface temperature increased by 0.74 °C (1.33 °F) during the 20th century. Climate model projections are summarized in the 2007 Fourth Assessment Report (AR4) by the Intergovernmental Panel on Climate Change(IPCC). They indicate that during the 21st century the global surface temperature is likely to rise a further 1.5 to 1.9 °C (2.7 to 3.4 °F) for their lowest emissions scenario and 3.4 to 6.1 °C (6.1 to 11 °F) for their highest. The ranges of these estimates arise from the use of models with differingsensitivity to greenhouse gas concentrations. An increase in global temperature will cause sea levels to rise and will change the amount and pattern of precipitation, and a probable expansion of subtropical deserts. Warming is expected to be strongest in the Arctic and would be associated with continuing retreat of glaciers,permafrost and sea ice. 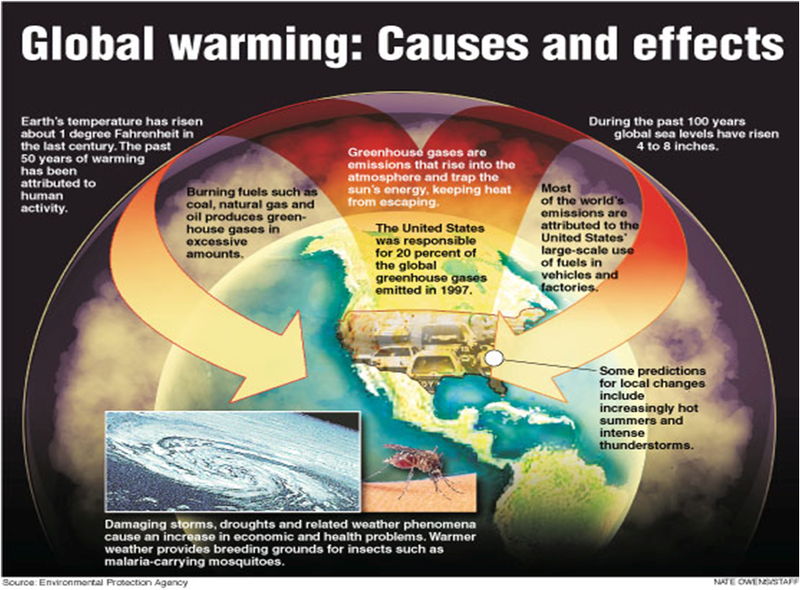 Other likely effects of the warming include more frequent occurrence ofextreme weather events including heatwaves, droughts and heavy rainfall events, species extinctions due to shifting temperature regimes, and changes in agricultural yields. Warming and related changes will vary from region to region around the globe, though the nature of these regional changes is uncertain. In a 4 °C world, the limits for human adaptation are likely to be exceeded in many parts of the world, while the limits for adaptation for natural systems would largely be exceeded throughout the world. Hence, the ecosystem services upon which human livelihoods depend would not be preserved. 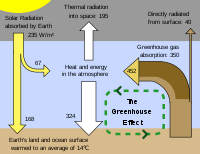 Proposed responses to global warming include mitigation to reduce emissions, adaptation to the effects of global warming, and geoengineering to remove greenhouse gases from the atmosphere or reflect incoming solar radiation back to space. The main international mitigation effort is theKyoto Protocol, which seeks to stabilize greenhouse gas concentration to prevent a “dangerous anthropogenic interference”. As of May 2010, 192 states had ratified the protocol. The only members of the UNFCCC that were asked to sign the treaty but have not yet ratified it are the USA and Afghanistan. 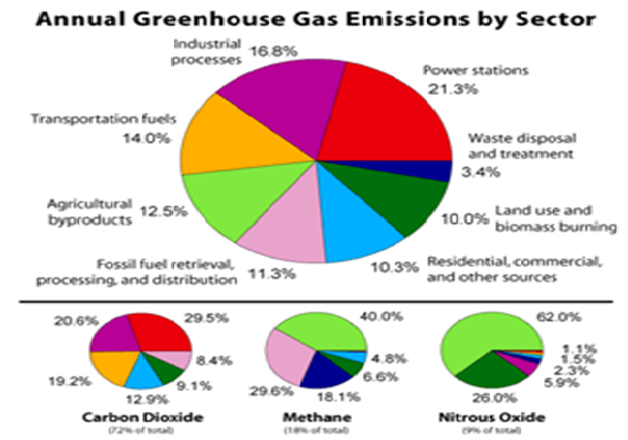 per capita green house emission 2005.
total green house emission, 2005. In 2007–2008 Gallup Polls surveyed 127 countries. Over a third of the world’s population was unaware of global warming, with people in developing countries less aware than those in developed, and those in Africa the least aware. Of those aware, Latin America leads in belief that temperature changes are a result of human activities while Africa, parts of Asia and the Middle East, and a few countries from the Former Soviet Union lead in the opposite belief. In the Western world, opinions over the concept and the appropriate responses are divided. Nick Pidgeon of Cardiff University said that “results show the different stages of engagement about global warming on each side of the Atlantic”, adding, “The debate in Europe is about what action needs to be taken, while many in the U.S. still debate whether climate change is happening.” A 2010 poll by the Office of National Statistics found that 75% of UK respondents were at least “fairly convinced” that the world’s climate is changing, compared to 87% in a similar survey in 2006. A January 2011 ICM poll in the UK found 83% of respondents viewed climate change as a current or imminent threat, while 14% said it was no threat. Opinion was unchanged from an August 2009 poll asking the same question, though there had been a slight polarisation of opposing views. A survey in October, 2009 by the Pew Research Center for the People & the Press showed decreasing public perception in the United States that global warming was a serious problem. All political persuasions showed reduced concern with lowest concern among Republicans, only 35% of whom considered there to be solid evidence of global warming. The cause of this marked difference in public opinion between the United States and the global public is uncertain but the hypothesis has been advanced that clearer communication by scientists both directly and through the media would be helpful in adequately informing the American public of the scientific consensus and the basis for it. The U.S. public appears to be unaware of the extent of scientific consensus regarding the issue, with 59% believing that scientists disagree “significantly” on global warming. By 2010, with 111 countries surveyed, Gallup determined that there was a substantial decrease in the number of Americans and Europeans who viewed Global Warming as a serious threat. In the United States, a little over half the population (53%) now viewed it as a serious concern for either themselves or their families; a number 10 percentage points below the 2008 poll (63%). Latin America had the biggest rise in concern, with 73% saying global warming was a serious threat to their families. 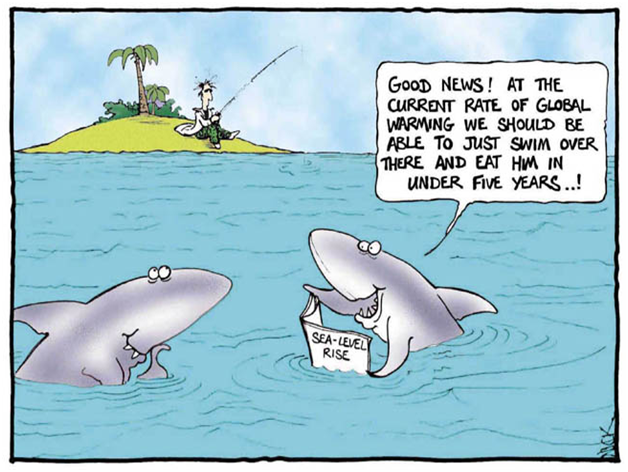 That global poll also found that people are more likely to attribute global warming to human activities than to natural causes, except in the USA where nearly half (47%) of the population attributed global warming to natural causes. On the other hand, in May 2011 a joint poll by Yale and George Mason Universities found that nearly half the people in the USA (47%) attribute global warming to human activities, compared to 36% blaming it on natural causes. Only 5% of the 35% who were “disengaged”, “doubtful”, or “dismissive” of global warming were aware that 97% of publishing US climate scientists agree global warming is happening and is primarily caused by humans. Researchers at the University of Michigan have found that the public’s belief as to the causes of global warming depends on the wording choice used in the polls. In the United States, according to the Public Policy Institute of California’s (PPIC) eleventh annual survey on environmental policy issues, 75% said they believe global warming is a very serious or somewhat serious threat to the economy and quality of life in California. Most scientists accept that humans are contributing to observed climate change. 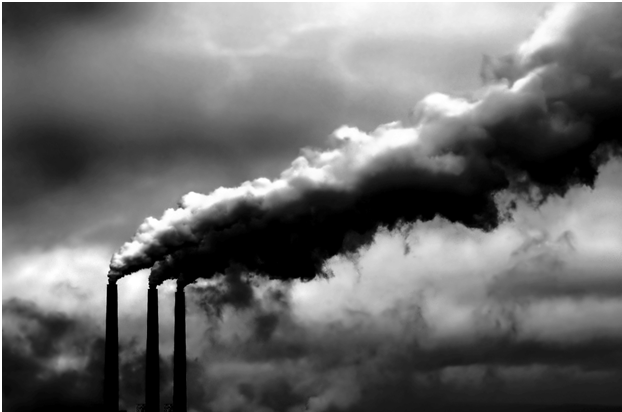 National science academies have called on world leaders for policies to cut global emissions. However, some scientists and non-scientists question aspects of climate-change science. Organizations such as the libertarian Competitive Enterprise Institute, conservative commentators, and some companies such as ExxonMobilhave challenged IPCC climate change scenarios, funded scientists who disagree with the scientific consensus, and provided their own projections of the economic cost of stricter controls. In the finance industry, Deutsche Bank has set up an institutional climate change investment division (DBCCA), which has commissioned and published research on the issues and debate surrounding global warming. Environmental organizations and public figures have emphasized changes in the current climate and the risks they entail, while promoting adaptation to changes in infrastructural needs and emissions reductions. Some fossil fuel companies have scaled back their efforts in recent years, or called for policies to reduce global warming. Environment – The term environment means which surrounding around us and is considered as composite term for the condition in which organism live. Environment is the sum total of all social, economical, biological, physical ad chemical factor which constitute the surrounding of the man who is both the creator and moulder of the environment. The industrial development and intensive agriculture that provides the goods for our increasingly consumer oriented society uses up large amounts of natural resources such as water, minerals, petroleum products, wood, etc. Nonrenewable resources, such as minerals and oil are those which will be exhausted in the future if we continue to extract these without a thought for subsequent generations. Renewable resources, such as timber and water, are those which can be used but can be regenerated by natural processes such as re-growth or rainfall. Mumbai: the BNHS began as a small society of six members in 1883. The influence on wildlife policy building, research, popular publications and peoples action have been unique features of the multifaceted society. Undoubtedly its major contribution has been in the field of wildlife research. It is India’s oldest conservation research based organization. The WWF-I was initiated in 1969 in Mumbai after which the headquarters were shifted to Delhi with several branch offices all over India. The early years focused attention on wildlife education and awareness. It runs several programs including the Nature Clubs of India program for school children and works as a think tank and lobby force for environment and development issues. Activities of this Center include organizing campaigns, holding workshops and conferences, and producing environment related publications. It published a major document on the ‘State of India’s Environment’, the first of its kind to be produced as a Citizen’s Report on the Environment. The CSE also publishes a popular magazine, ‘Down to Earth’, which is a Science and Environment fortnightly. It is involved in the publication of material in the form of books, posters, video films and also conducts workshops and seminars on biodiversity related issues. The Botanical Survey of India (BSI) was established in 1890 at the Royal Botanic Gardens, Calcutta. However it closed down for several years after 1939 and was reopened in 1954. The ZSI was established in1916. Its mandate was to do a systematic survey of fauna in India. It has over the years collected ‘type specimens’ on the bases of which our animal life has been studied over the years. Its origins were collections based at the Indian Museum at Calcutta, which was established in 1875. “Science without philosophy is just mechanics”. The Supreme Court of India has become one of the most progressive courts in the world when it comes to environmental protection. Closing down companies that continue to pollute the environment as well as making it mandatory for TV and radio stations to run environmental programme. MC Metta is at the forefront of the development of public interest environmental law globally. ___—___ WHY UPES NEEDS TO FOCUS ON ENVIRONMENTAL STUDIES AND ISSUES LIKE GLOBAL WARMING? ? ?